Helps prevent the harmful penetration of road grime, salt, leaf gum and bird dirt. Keeps re-colour provided by Soft top reviver even longer. Now with UV inhibitor - Mould and Mildew resistant. Please note: It is advisable to test on an inconspicuous area of your convertible top prior to use, as some colours may appear lighter or darker after application. 1. Dry brush the soft-top to remove any loose dust/dirt. 2. Pour Ultra Proofer into a suitable container/bowl. 3. Stir well before application. 4. Apply Ultra Proofer with a new 5cm/2inch paintbrush ensuring that the fabric is completed wetted out. It is best to commence application in the centre of the soft-top and as quickly as possible progress towards each side, the front and the back of the soft-top. Wipe excess drips from paintwork, trims and glass with a damp cloth. 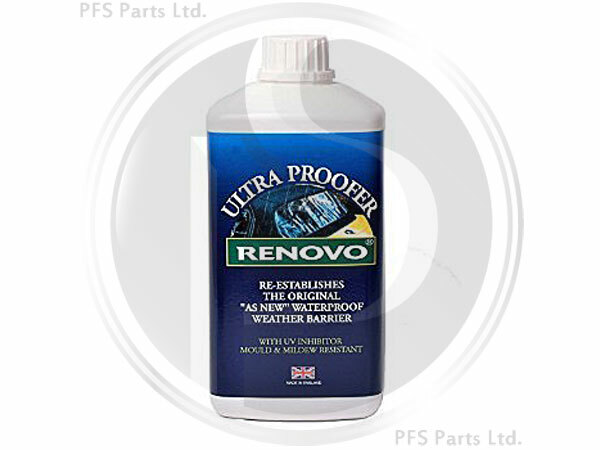 Depending on the condition of the top a litre of Ultra Proofer is usually sufficient for two coats on an average size soft-top. It is important to allow Ultra Proofer to dry between coats. Always ensure that you have enough Ultra Proofer to coat the soft-top completely and that you will not run out half way through application! 5. Allow the top to dry for approximately three hours, this will depend on the drying conditions. The Ultra Proofer may dry out more quickly if it is a warm day and may take longer to dry if it is a damp day. 6. Wash out brush in warm, soapy water. Do not take car out in rain/wet weather until the Ultra Proofer has completely dried. The soft-top is now water and stain repellent, will resist the growth of mould/mildew and is protected from harmful Ultra Violet rays. To ensure best possible weatherproof protection we advise that Ultra Proofer is applied every six months.